So, the latest from here is that I'm about to get crazy busy and work, and socially. Which, truth be told, is awesome. I've been trying to connect, at least via text with all the folks I care about and haven't had time to see. Not a lot on the books for the weekend. I need to do laundry, and I need to get groceries. The usual dynamic duo. I'm bummed to report that the pedicure I got last weekend has already chipped some. That's a shame, because I liked the fun, shiny red color. I'll try and repair it, I think. Or obscure it with glitter, or... we'll see. Maybe I'll blow a few bucks and get it redone. And a manicure along with it. That's how I roll, yo. I'm two months into the new job, and I really feel like it's the best choice I've made in ages. I love it there. Love the people, love the work, the office, my customers... ain't love grand? I need to get back on the healthy eating regimen. I've been a little too freewheeling with the sugar as of late. But who doesn't love sugar? Exactly. 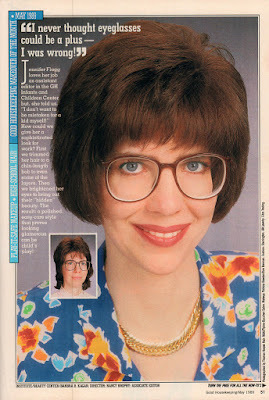 I'm getting my hair cut next week, so I've been putting together a stack of pictures. Because obviously, I'm a dead ringer for Meg Ryan and Annette Bening, all rolled into one. Here's kind of a funny/sad story from my youth. In Middle School, I was trying to come up with a hairstyle and I remember I had a *Good Housekeeping* that I was using for inspiration. And I remember one of my teachers looking at me with what I now realize was pure pity. 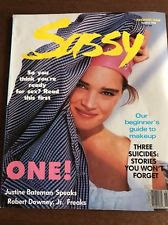 You see, I grew up in the age Seventeen, Teen, YM, and of course, the ne plus ultra of girly mags, Sassy. Look, let's be honest - even at the age of 13, I was tragically unhip. It's fine. Really. But damn. Should a 13 year old really aspire to this? We'll have to see what our friend at the salon can do with my coif. I've also been reading up on makeup tips, and trying to make my squinty eyes look larger. So far I've been successful in making them look sooty. The things I do to be gorgeous for you all. I hope you appreciate it! I normally take it easy.